In Linux kernel, drivers can be put in two ways. One is, you make it as a part of kernel and will be part of vmlinux image. Another thing is to build the drivers separately and dynamically plug it into the Kernel. 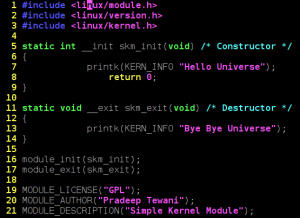 So, the driver which is loaded dynamically into the kernel is known as kernel module. Modules are very handy during the development phase. Before writing a module, you need to understand the kernel C. So, you might be wondering, do I need learn one more language for coding in Kernel? Don’t worry, Kernel C is normal pure C with GNU extensions. Now, what is pure C? It means C without access to any user space libraries such as glibc. Kernel includes all the code as a part of itself. 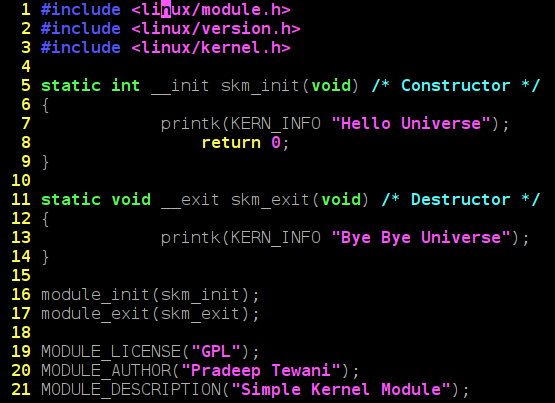 This is the code which kernel developers have developed as a part of kernel and is placed at <kernel_source>/kernel/lib. As can be seen, every module has a constructor and destruction function. skm_init is the constructor and skm_exit is the destructor. Now, as with object oriented programming, constructor is invoked when the the object is instantiated, similarly, over here, constructor is invoked when the module is dynamically loaded into the kernel. So, when will destructor be invoked? Of course, when the module is plugged out of the kernel. Macros module_init() and module_exit() are used to specify the constructor and destructor for a module. Equivalent of printf() in kernel is printk(). Header file ‘kernel.h’ is kernel space header file which includes the prototype for printk and other commonly used functions. module.h includes the module related data structures and APIs. Macros module_init() and module_exit() are defined here. File version.h contains the kernel version. This is included for the module version to be compatible with kernel into which the module will be loaded. Apart from this, we have a macros beginning with MODULE_. These specify the module related information and form the module’s signature. In order to build a kernel module, you need to have the kernel source code which is usually found at /usr/src/linux. If not kernel source, at least you need the kernel headers. Building a kernel module is different from a building any application. Normally, applications are compiled using the gcc command and by default, gcc picks up the libraries in /usr/lib. But, as discussed earlier, kernel code is a self-contained and doesn’t uses the libraries from the user space. So, we need to give the command line options to gcc to not to take the standard libraries. Not only that, since the module is going to be the hot plugged into the kernel, it has to be compiled with the same flags as the kernel was compiled with. In order to take care of these things, we invoke the kernel makefile to compile our module. Here, it is assumed that the kernel source is placed at /usr/src/linux/. If it is placed at any other location, update the location in KERNEL_SOURCE variable in this Makefile. The output of the make would be skm.ko. In order to list the modules, execute lsmod as below. This will show you the skm loaded. Note that while unloading, we use module name (skm), not the file name (skm.ko). So, now we are comfortable with writing & building a kernel module. This is the basic building block of the Linux kernel development. In the following articles, we will dive into the Linux Kernel Programming. So, stay tuned! This entry was posted in Linux Kernel Internals and tagged Building Kernel Module, Linux Driver, Linux Kernel Internals, Linux Kernel Module on March 1, 2015 by Pradeep D Tewani. 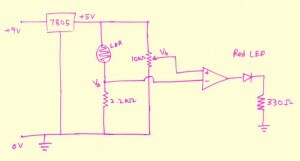 This 2nd article in the series of “Do It Yourself: Electronics”, starts with the journey of sensors. After attending their regular afternoon classes, Surya & Pugs met near the Innovation Centre, headed towards their hostel rooms. “What a waste of energy!”, exclaimed Surya pointing out to the street lights glowing on in the bright day. “Possibly the switch man is not well and couldn’t come to switch off the lights”, said Pugs calming Surya. “But, why do you need a switch man for switching on and off street lights?”, retorted Surya. “What do you mean?”, asked Pugs with a puzzled look. With that Pugs followed Surya into his room to watch the design evolve. “By the way, what kind of circuit would it be?”, asked Pugs curiously. “Think and you tell me. That is the first part of the design”, replied Surya. “Exactly, that’s what I was telling you”, boosted Surya, dismantling the so built breadboard design. “Hey, why are you breaking it?”, asked Pugs trying to stop Surya. “That was simple. And so now you design it”, replied Surya challenging Pugs to redo the design on his own. “No-no. You just tell me the techniques of debugging. I’ll do it myself”, retorted Pugs. With that, Pugs reversed the connections and viola – everything was working right. Super excited with the light sensing gyan from Surya, Pugs went to the local market to purchase the various components to build his own circuits. He purchased all the stuff shown to him by Surya till now, and then called up Surya asking what else shall he purchase, may be for his next circuit experiment. 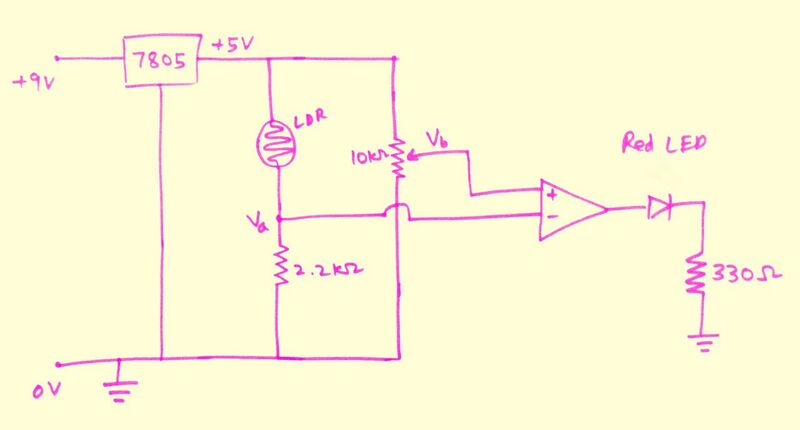 Surya suggested him to get an infra red transmit LED, an infra red receive diode, and four BC546 transistors. This entry was posted in Electronics and tagged basic electronics, basic electronics tutorial, Battery, Breadboard, build your own light sensor, building electronic circuit, debugging an electronic circuit, DIY, Do It Yourself, Electronic Circuits, Electronics, electronics sensors, home made light sensor, how to build a light sensor, LDR, LED, Light Dependent Resistor, Light Emitting Diode, light sensor, making a sensor, Opamp, Pot, Potentiometer, Resistor, simple electronic circuits, Wire on March 1, 2015 by Anil Kumar Pugalia.